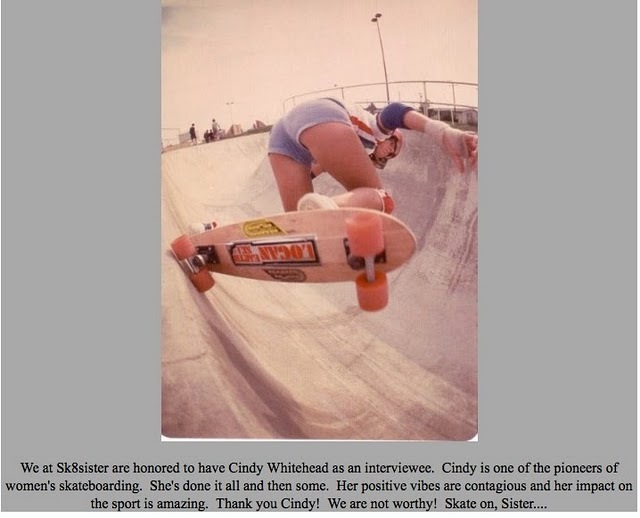 She has a couple of websites here and there, including a blog cindywhitehead.blogspot.com that she maintains everyday, rain or shine... Cindy Whitehead was a professional skateboarder back in the mid 70's to early 80's.She skated pools and 1/2 pipes and was sponsored by Sims, Tracker Trucks, Jay Adams Flyaway Helmets and rector pads. Sher recals that: "I was lucky enough to hang and skate with all the best skaters around. Road Trips all over the USA, Hester Series, Marina Skatepark - living the life and having a blast! Some of my best friends were met through skateboarding." Cindy knows that we love her (and Ian too... hum) because she is a great human being and she has a great sense of humor (and also because she is a pool rider for life). A couple of year ago, Sk8sister, the first and only company dedicated to selling products strictly from brands that support female skaters - (best idea ever!) 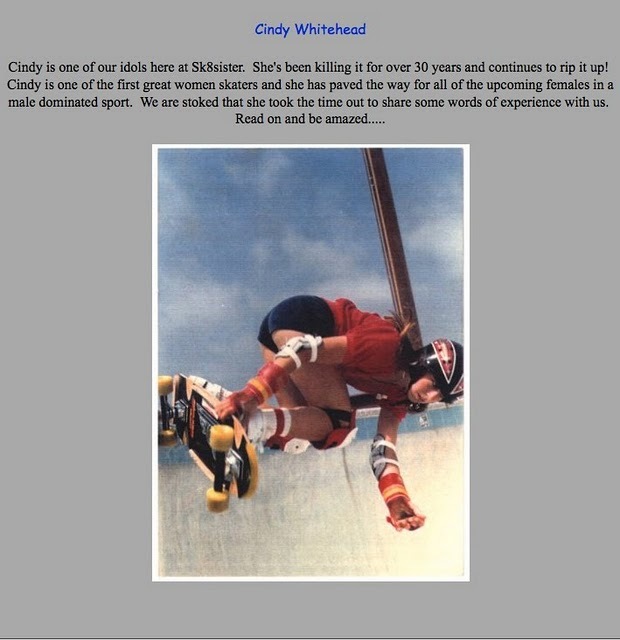 decided to interview Cindy Whitehead. Since then, the interview has been removed from the web site, but we managed to salvage this (which is a lie because actually Cindy did it...). Thanks Cindy and happy Birthday Cindy Whitehead! Thank you for the awesome write up and birthday wishes. Xavier, you rock!! !